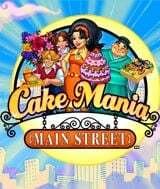 In Cake Mania, the first installment of the smash hit Time Management game series, we meet Jill Evans, who grew up learning all about the culinary world in the kitchens of her grandparents bakeries. After a long absence from home, she returns to find that her beloved grandfather's bakery has been bought out and put out of business by MegaMart. Determined to get Evans Bakery back, Jill's plan is to sell cakes out of her home until she can afford to buy the shop back and re-open it. Playing as Jill, you'll have your work cut out for you in Cake Mania. As customer comes in, you'll have to take orders, prepare them, serve the customers and collect money. As your business grows, so will the sophistication of the products you're selling and the equipment you're able to use to make all those delicious cakes. 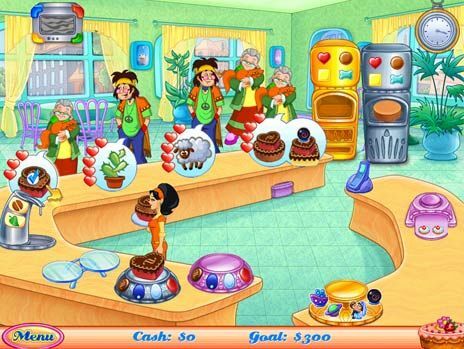 If you like fast-paced Time Management games with a dash of humor and worthy cause (and serving up gorgeous cakes to those who need them is certainly worthy), then you have a lot to look forward to in Cake Mania and all its sequels. Polished graphics, good tutorials, and a fun sense of humor. Bake in four unique locales. Customize your kitchen in the shop screen.